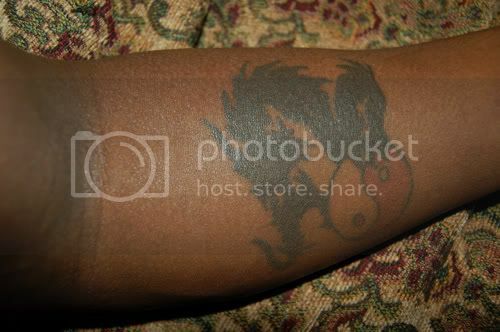 My father wanted a dragon tatoo for his ankle, I quite honestly dont remember why. I just remember being 13 when he got it. When he went in he found a design he had liked, but the dragons tail was weaving through a celtic knot. My father wanted a yin-yang instead, and talked with one of the artists at the studio who was visiting from Ireland at the time, for school or some reason like that( Memmories are a bit hazy). I was 13 when he got it :-P ... i'm not gunna say how old HE was, lol. But yeah.. i like how his is slightly bigger and slightly darker..seem to fit. calvin and hobbes, hugging. The original picture has them with their eyes closed. But I had the artist make them open. I got this tattoo because I have loved C&H since I was 6! yeah I wanted a tattoo when I was 6. I chose this inparticular design to symbolize how important my friends and family are(got it on my left peck over my heart). I hopefully in april when my brother comes back from training (navy), we will both go get tattood. We might both get something in Alibata (Ancient Filipino Script) I was thinking of getting something in the lines of Little Brother, because thats how I'm known to alot of my older friends (LiL'BRO) which is now on a first name basis.... to the point that some of them don't know my first name. initially when i got this, it was something significant to letting go of a relationship which haunted me mentally and emotionally for a good year plus after it had ended. however it's stuck with me beyond just that, and I've found that in more than one way, it means something profound to me, and I hope to get something similar (different picture, same design concept) on my right arm to reflect that here soon. I stole this from the Skype quote thread. Captions kindly *glare* added in by Morolen. 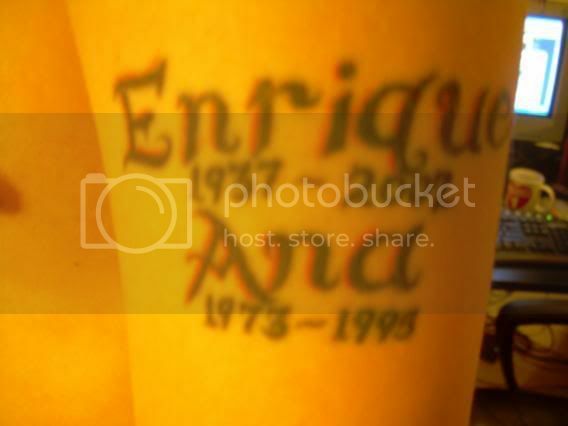 I got this on March 31, 2006. I went into the tattoo parlour that day with my friends John and Paula. Paula was gonna get her tattoo and John was gonna get his ears 8g pierced. A simple outline tattoo was only 40$, so, feeling a tad left out, I decided to get something small too. Yeah, it was an unplanned, unthough-out, impulsive decision. But I don't regret it. When I'm older I may go over it or fix it up a bit, but I'll always have it reminding me of a hell of a lot. It'll remind me of my high school stoner years, growing up in the Haight, the people I was with when I got it, etc. I like it. It's a little memory I'll get to keep with me forever. When the triangle is pointed up it is one of the symbols for fire, when it's pointed down it's one of the symbols for water. The norse rune for the tree of life. The norse rune for Thor's Hammer. I did these myself back at a point in my life when I was studying norse mythology/history/mysticism extensively. Each rune has it's own meaning and it's own properties/deities assigned to it. The triangle is an occult symbol and has always been one of my favorates because it shows that two "elements" which are so different are also so closely related (this is using the occult/alchemical definitions of the word element and what fire and water represent). These two names and dates are as follow. The top one is my father, who died when I was 18 from Parkinson's Disease. The one below it is my sister who died when I was 10 in a car accident. I am planning on eventually having the names of all those who I greatly cared for in my life and who died tattooed on my left arm and my own name to be on the inside of my wrist. 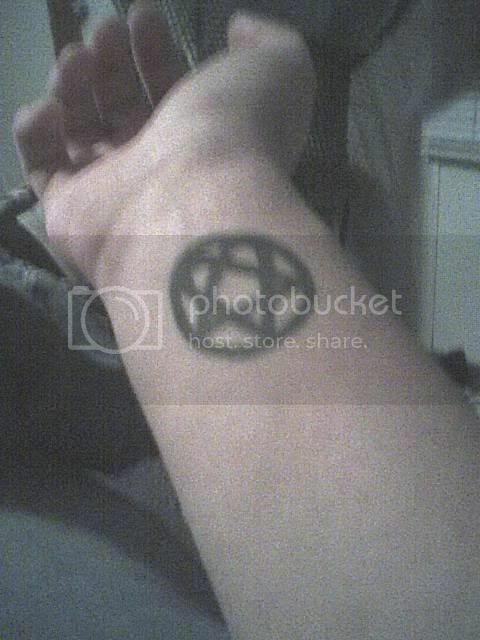 This is the symbol of my religion (for those who don't know, I am a wiccan). 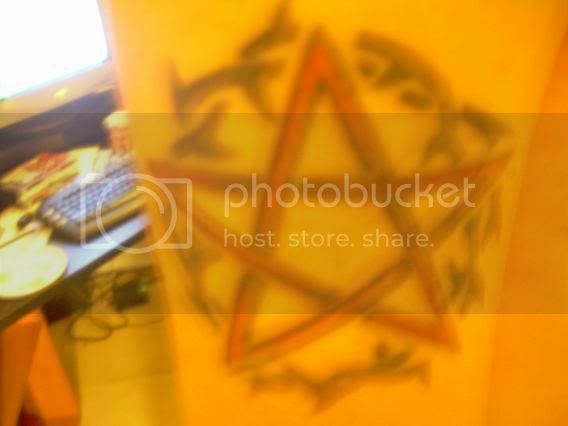 I got the star part of the penticle done in a celtic knot not only to show how each of the elements are interconnected but also because wicca as a religion (even though it's only been a recognized religion for less then a century) has it's roots in the old celtic mysticism/traditions. The circle was done in the tribal style and the reason why it's a circle of thorns is to both show that this is an "earth based" religion and as the "tribal style" of tattooing is supposed to be derived from early man's styles of drawing, to show that nature itself has been around for a good, long while (to say the least.). These last tattoos were done by a friend who unfortunately I lost contact with shortly after she did these for me due to her falling into several addiction problems. The first one is the norse rune Tyr, which like the other runes has it's own meanings attached to it. The second one is a design she had done for me which I liked. 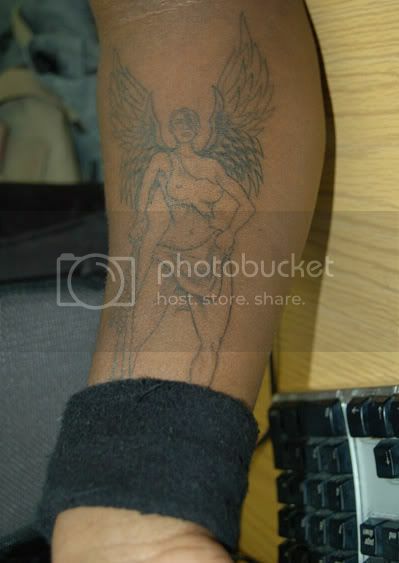 It's a tattoo which I could have had covered up several times over, but I have kept it because around the time this was done me and her were good friends and I keep it as a homage to that friendship. Brighter days lie ahead. . . Interests:Photography, Illustrating, Designing, Working Out, Hanging with good friends, Glowsticking, Video Games, Food, Women, skateboarding, longboarding. I got this one for my birthday last year (sept. 11th). I worked on it for like 2 years (not literally, but the concept and how much meaning would be behind it). It's my representation of the Virgo Virgin as more of this warrior like figure. I'm pretty much into signs (though I don't do horoscopes, I find zodiacs interesting) so it does hold a great amount of meaning to me. 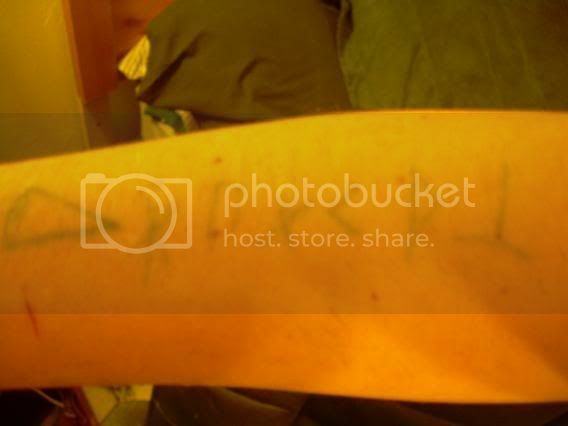 that's actually my 3rd tattoo ( and not my last), but I don't have good pics of my other 2. I'll post those up when I do. I'm trying to work on my next design, but it's so hard with my school and work schedule. can't even think straight let alone come up with a fresh idea for a tattoo. so was mine honestly. I had only vaguely thought about why i had wanted to get what i had tattooed for about 2 days, and I honestly didn't think I'd want it there after about a month, but it's really grown on me. as for your tattoo idea, starlite, i like it. 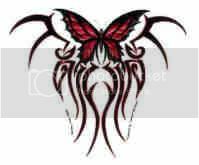 but how does a butterfly with some tribal fit in with the loss of your sister? maybe i missed that part in your other thread. Interests:I like a lot of things that are deemed "counter-culture." Anything anti-Bush is swell as are Fair Trade items, abolish capitalism!<br /> Writing for the local paper, knitting, sewing and going to protests are things I live for. Somewhere, in my busy schedule of highschool, college classes and political activism I find time to practice my glowstringing skills. That's right, glowSTRINGing. I'm still a noob at stringing though, even though I've been into glow arts for awhile, it's hart to transition from sticking to stringing. 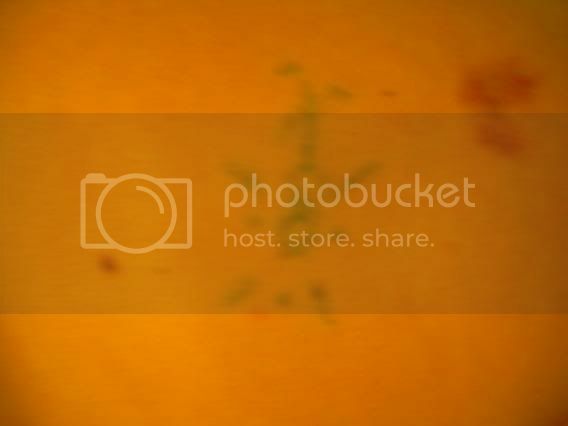 well, I'm computer illiterate so I don't know how to upload pictures to here from my files but... my tattoo is going to be a celtic moon on my lower back. 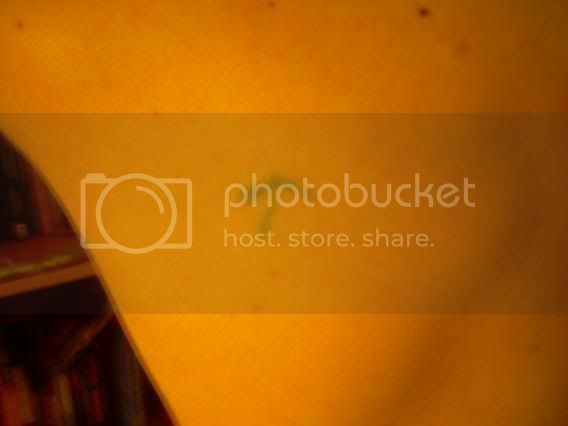 As my friends like to call it a "tramp stamp," meh, I don't care. My second one is going to be a barcode on the inside of my lip. EDIT: That's really sad about your sister. *sigh* the world that we live in, what has it come to? that is really sad....i'm terribly sorry. I want to add more to it, thinking about an image of her and some wings on her back; just waiting for the time and the money to do it, probably this spring break. She truly was a heaven sent Angel to me. 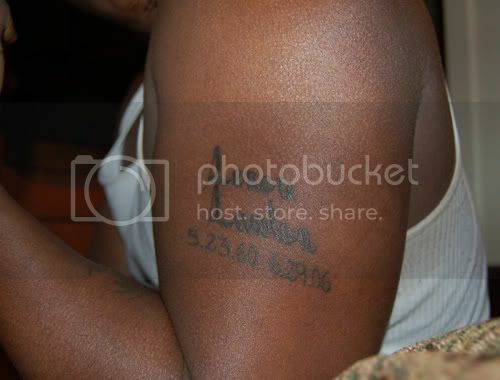 This tat, is really old, my first. 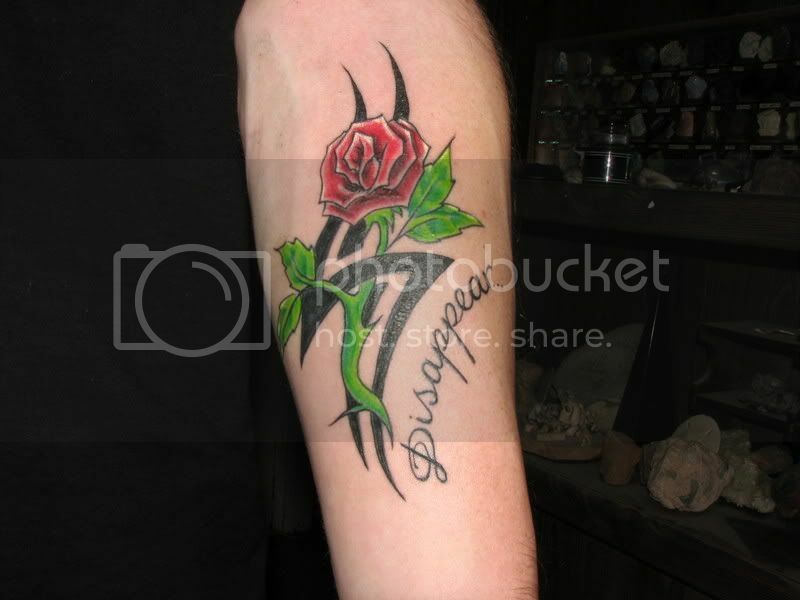 I really wanted a tattoo when I was 15, and I got it. no real meaning other than "I got my first tattoo". 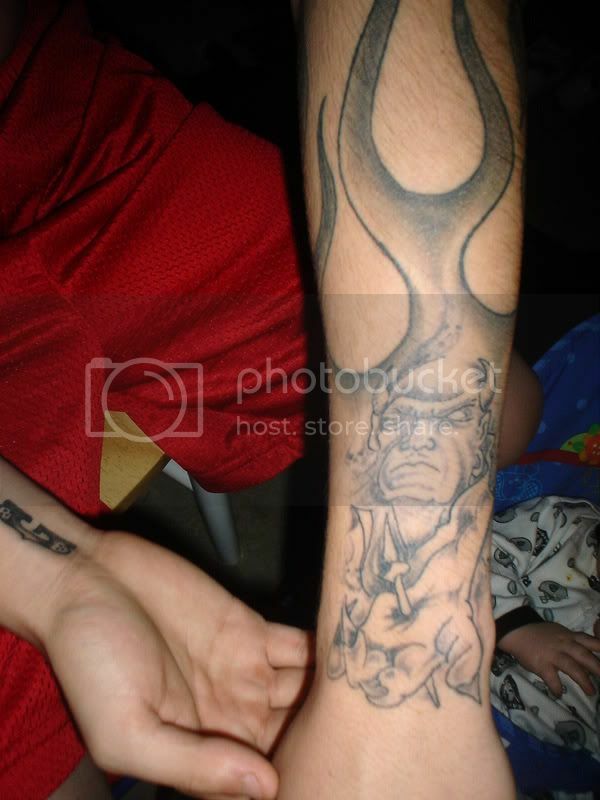 but it has a yin yang in it, one of my favorite symbols. sorry for the crappy webcam pic but im to lazy to resize a good quality picture. the kanji means pure and clean . i got this when i was trying to quit my drug addictions. this help me through it. 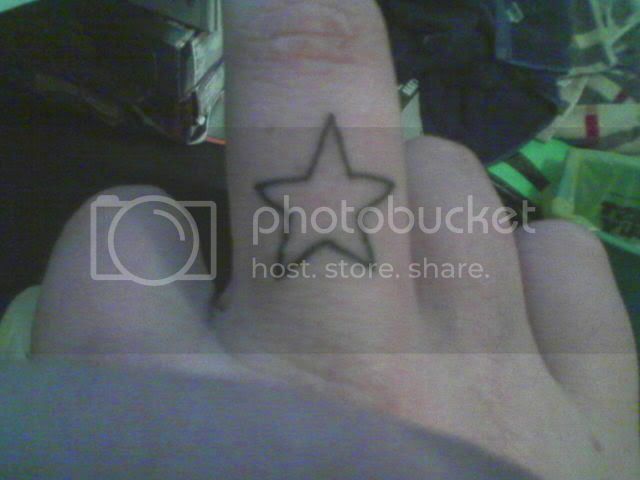 i also got an outline of a star. which doesnt mean anything. 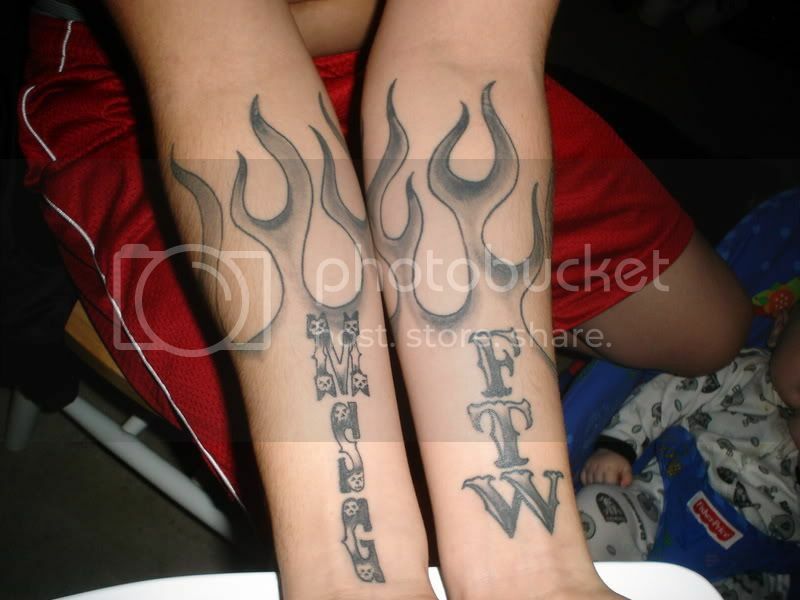 -the flames represent my son....who is an aries....and thats a fire sign so i got hot rod flames. -the devil with a spike through its hand is from a saying my grandmother used to tell me when i was in my tough guy phase" even evil feels pain!" Okay, guys. Opinions needed. After spending a lonnngg time thinking about it, I've decided upon my next tattoo. 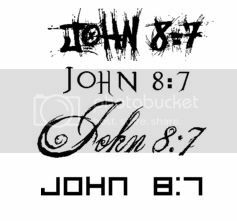 I'm going to get "John 8:7" tattooed on my ankle. I'm not a religious person whatsoever. I'm against organized religion almost more than I should be. But this one verse means so much to me. But when they persisted in asking Him, He straightened up, and said to them, "He who is without sin among you, let him be the first to throw a stone at her." Anyways, I need help deciding the font. I could see you picking the first. But personally i like the fourth one.